Brewer Description: (from tag on bottle) Passion of love. 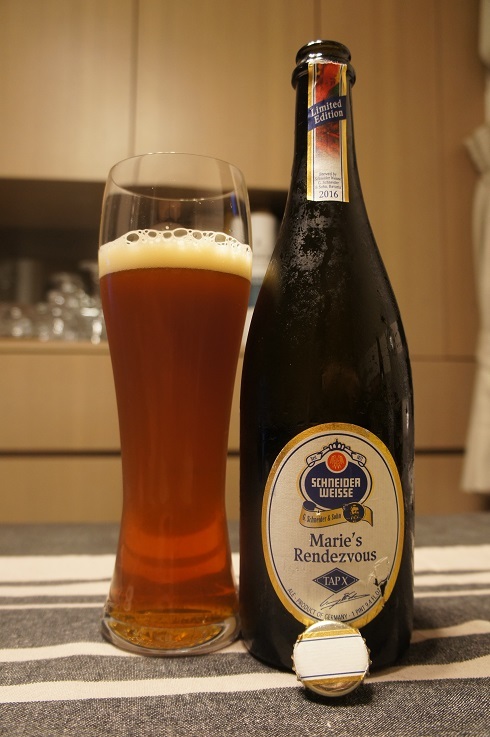 “Marie’s Rendezvous” – a tempting golden honey enjoyment of wheat beer with exceptional intensity and opulence. Tap X Marie’s Rendezvous is dedicated to our ancestor Anna-Marie Schneider, whose encounter and her deep love to George I. was the start of our six generations of wheat beer passion. Full-bodied, with soft sweetness, complex fruitiness, fine peppery flavour and courageous strength. A true feast for the senses with a refreshing dry finish! Simply fantastic liaison with a festive roast, light mousse with fresh fruits or aromatic apple fritters with vanilla ice cream. Be careful – it could be LOVE! Intro: A 750ml bottle with a best before date of 15th January 2018. Poured into a Riedel weizen glass. Appearance: A clear copper amber colour with a one finger light beige head that dissipated fairly quickly while leaving some lacing. Aroma: Freshly crushed apple juice, red grapes, plum and brown sugar with light caramel in the background. Taste: Sweet fruitiness, plum, prune, raisin, grape and apple. Honey and caramel sweetness and a touch of peppery spice come through on the finish along with a hint of boozy alcohol. Mouthfeel: Medium to full bodied with light carbonation. Overall: I’m a big fan of Schneider, but this one just didn’t work out for me. Too much sweetness, the spice and the booziness just clashed and made it hard for me to finish. 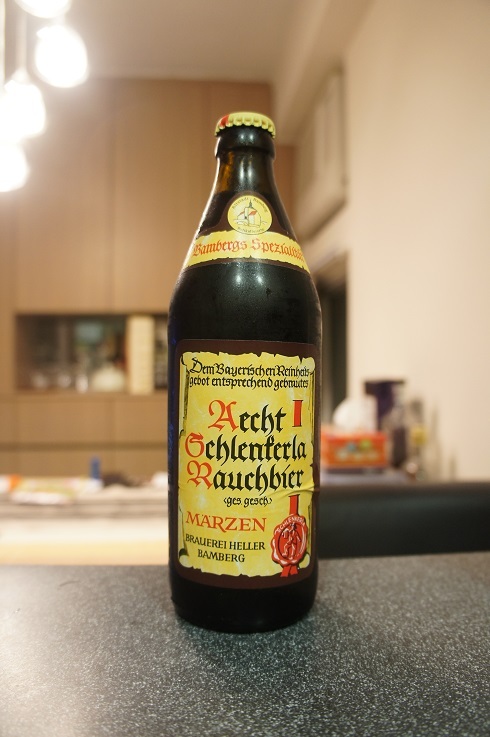 Brewer Description: (from website) Bamberg’s speciality, a dark, bottom fermented smokebeer, brewed with Original Schlenkerla Smokemalt from the Schlenkerla maltings and tapped according to old tradition directly from the gravity-fed oakwood cask in the historical brewery tavern. Intro: A 500ml bottle with a best before date of May 2017. Poured into a Lost Abbey teku glass. 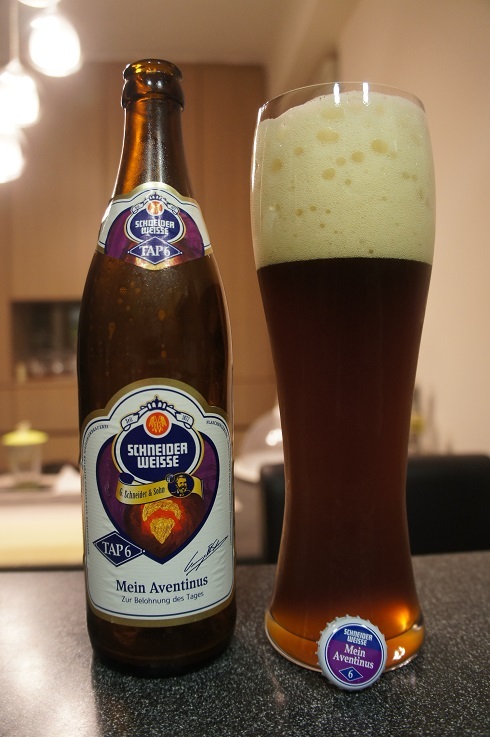 Appearance: A clear dark amber colour with a two fingered tanned head that had decent retention and left nice lacing. Aroma: Smokey, bacon, ham and toast. Taste: Smoked meats especially ham and charcoal-ly upfront before giving way to sweet-ish caramel malts and a touch of fruit. 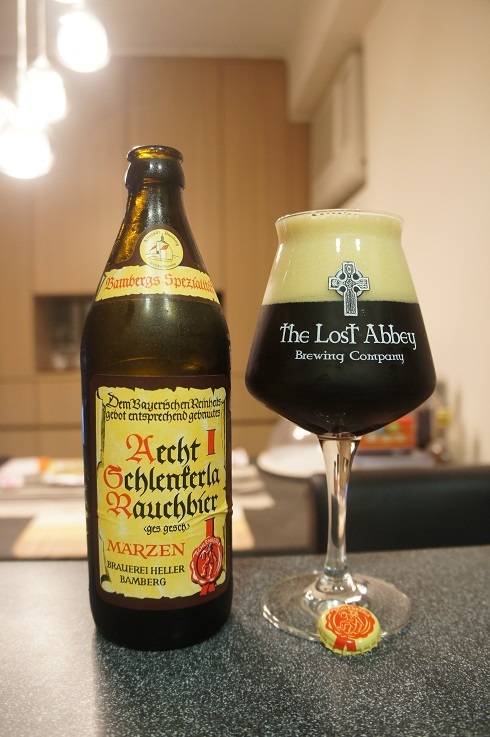 Overall: A very nice smoked beer with lovely smoked ham aromas and taste balanced with a touch of sweetness. 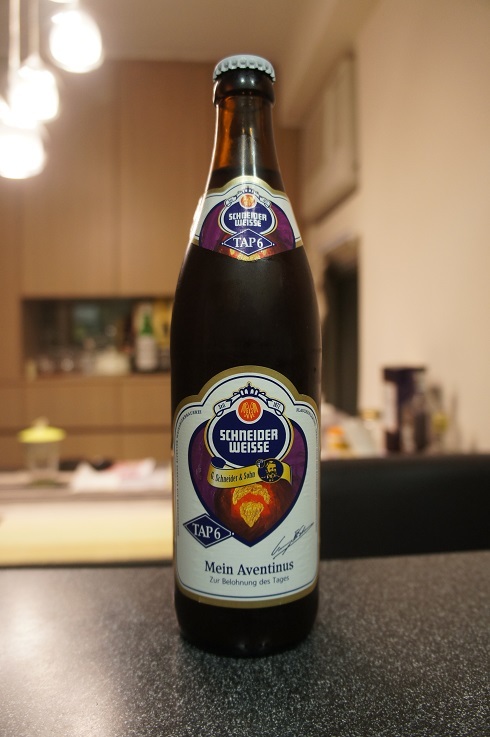 Brewer Description: (from website) For great moments by the open fire: “Mein Aventinus” – full-bodied, dark ruby coloured, intense and full of fire, warming, balanced and smooth. Bavaria’s oldest wheat doppelbock – since 1907! Its powerful body in combination with its malt-aromatic sweetness provides genuine pleasure – an ingenious combination, perfectly drinkable. Cheers – to this day! It goes well with hearty fare, roasts and sweet desserts. Intro: A 500ml bottle with a best before date of 19th May 2017 and poured into a Riedel weizen glass. Appearance: It poured a slightly cloudy dark amber brown colour with a big four finger white head that dissipated slowly to a nice thin creamy cap and left nice lacing. Aroma: Biscuit malt, wheat, banana and clove. Taste: Banana bread, brown sugar, clove with a touch of plum, caramel and apple skin. Overall: Very nice and easy to drink which is great since I can now (finally) get this regularly. 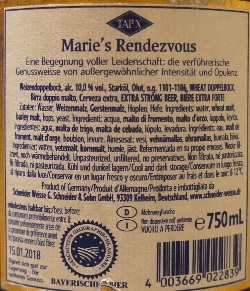 Brewer Description: (from website) Go on a discovery: “Meine Hopfenweisse” – an incomparable taste experience that exceeds all expectations…. 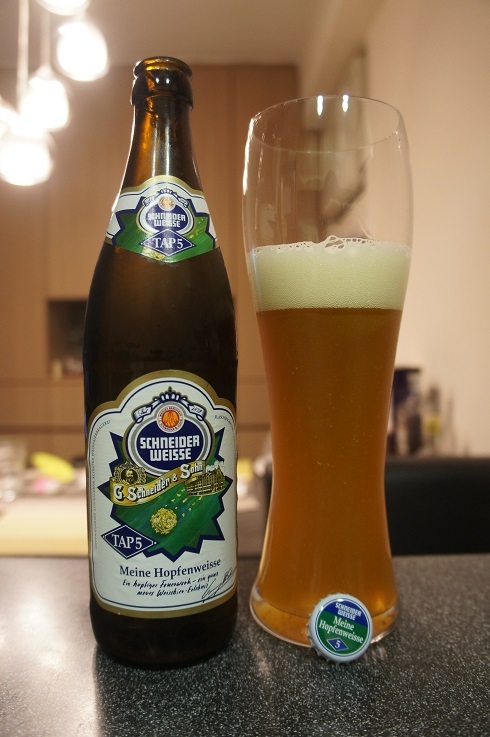 Flowery hoppy, full-bodied with malty aromes – this is how far wheat beer can go. A special Schneider treat! It is the ideal companion to spicy dishes and refined chocolate. Fireworks for your senses. Shiny golden wheat doppelbock. 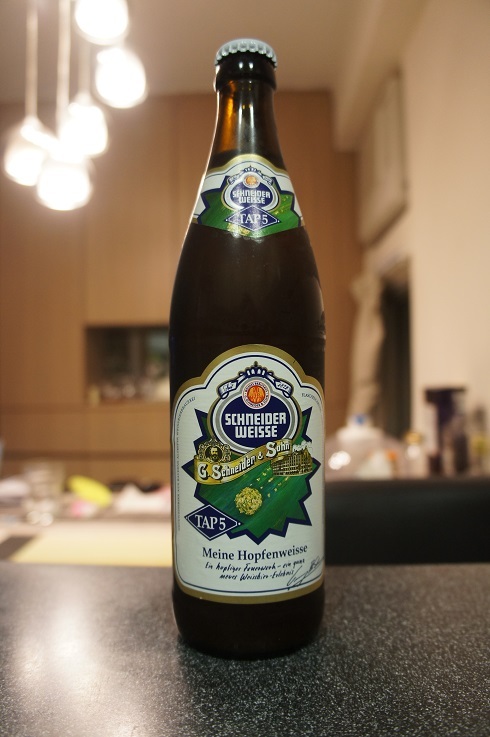 Intro: A 500ml bottle with a best before date of 1st February 2017 and poured into a Riedel weizen glass. Appearance: It poured a rather dull and cloudy orange copper colour with a two finger white head that had decent retention and eventually settled to a thin creamy layer and left nice lacing. Aroma: Strong floral and herbal notes with orange pith and orange peel with a touch of bready malts. 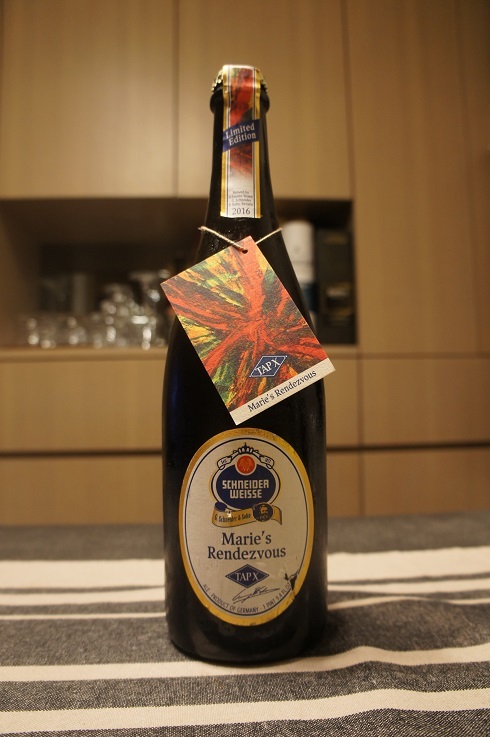 Taste: Quite similar to the aroma, there is strong orange pith and orange juice flavours followed by grapefruit, floral, herbal and grass with a hint of spice, mango and bitterness. Overall: I can see why others might enjoy Tap 5, but for me, I’m on the fence with this one; maybe even leaning slightly towards buying it again as it is very easy to drink and does not feel anywhere near the 8.2% abv. My main conflict was the strong floral aromas and flavours which were not my favourite. 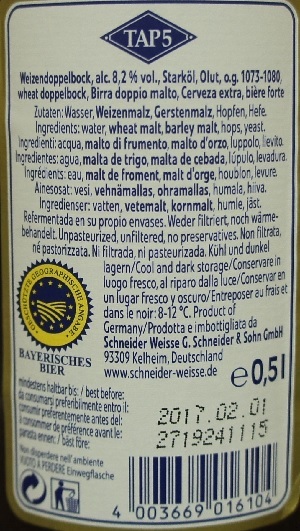 Brewer Description: (from website) Our brewing history begins with this beer. 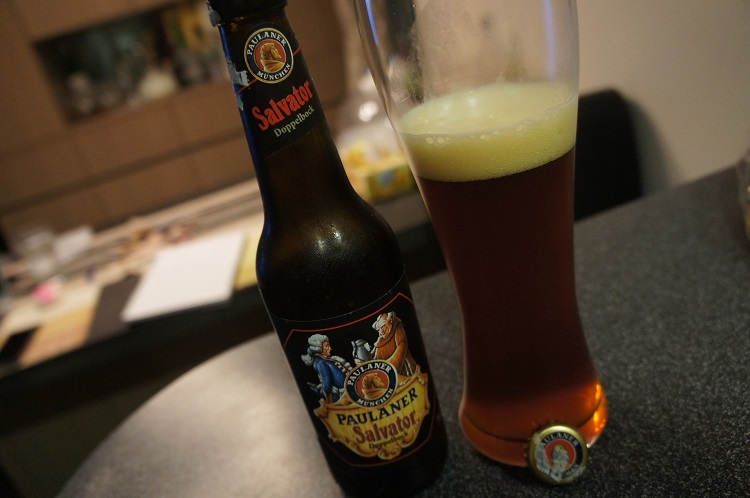 And the history of strong beer in Bavaria – it was the Paulaner monks, who invented this bottom-fermenting double bock. 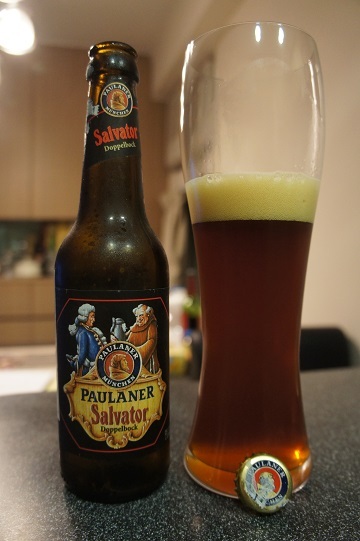 We have been brewing the Salvator for over 375 years – always according to the original recipe, which was continuously refined over the years: The head is the colour of caramel and the beer is chestnut brown, combined with a seductive flavour of chocolate to give a pleasing intensity on the palate. Hereto comes the finest Munich malt, rounded off by a light note of hops in the background. Often imitated but never duplicated: The father of all double bock beers, of which the names always end in “-ator”! 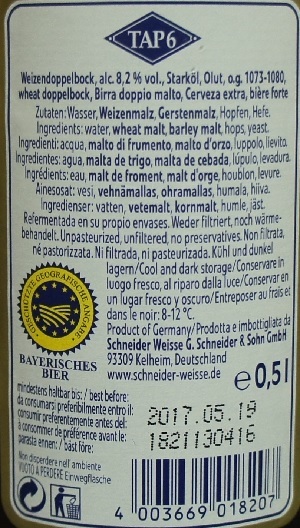 Intro: A 330ml bottle with a best before date of May 2016 and poured into a Riedel weizen glass. Appearance: It poured a deep red amber colour with a just under two finger light tanned head that dissipated quickly leaving sparse spotty lacing. Aroma: Sweet honey, caramel, overripe banana, plum and fig. Taste: Taste was also very sweet, probably over sweet for my palate. Lots of toffee, butterscotch, caramel, grape, plum and prunes. Mouthfeel: Medium bodied with low to medium carbonation. Overall: If it was less sweet, this would have been really good. As it is, its not so sweet that I don’t want to drink it again, yet at the same time, I can’t finish a whole bottle myself due to its sweetness. Around half a bottle and I’m done. Or I just drink it really slowly. 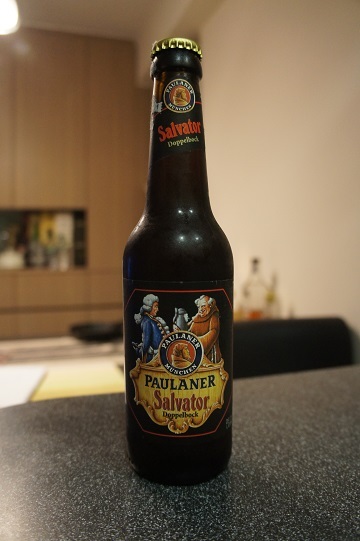 Because of this, I currently prefer both Ayinger Celebrator and Weihenstephaner Korbinian over Salvator.